Model selection from a set of candidate models plays an important role in many structural equation modelling applications. However, traditional model selection methods introduce extra randomness that is not accounted for by post-model selection inference. 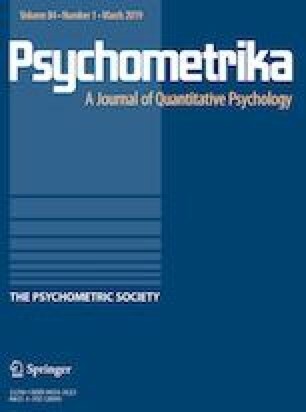 In the current study, we propose a model averaging technique within the frequentist statistical framework. Instead of selecting an optimal model, the contributions of all candidate models are acknowledged. Valid confidence intervals and a \(\chi ^2\) test statistic are proposed. A simulation study shows that the proposed method is able to produce a robust mean-squared error, a better coverage probability, and a better goodness-of-fit test compared to model selection. It is an interesting compromise between model selection and the full model. The online version of this article ( https://doi.org/10.1007/s11336-018-9624-y) contains supplementary material, which is available to authorized users. We would like to thank the reviewers for providing valuable comments. Shaobo Jin was partly supported by Vetenskapsrådet (Swedish Research Council) under the contract 2017-01175. Muthén, B., du Toit, S. H. C., & Spisic, D. (1997). Robust inference using weighted least squares and quadratic estimating equations in latent variable modeling with categorical and continuous outcomes. Retrieved from https://www.statmodel.com/download/Article_075.pdf. Accessed 12 Sept 2013.